Running a clothes shop is bound to keep you busy from day-to-day, and with little spare time on your hands it’s sometimes easy to overlook certain aspects of running your business. One of those aspects is ensuring that you’re thoroughly protected against the threats that could jeopardise the financial security of your shop. 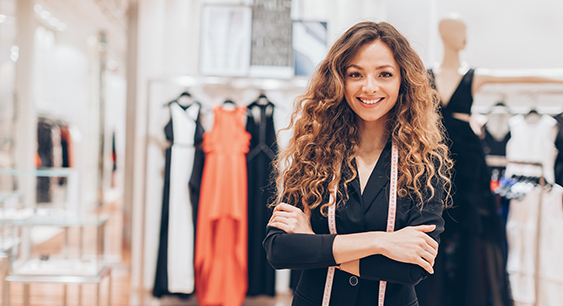 Whether you run a small boutique in a niche market - or a larger fashion store selling a wider variety of clothing and accessories - you will almost certainly benefit from the protection and security provided by a tailored clothing shop insurance package. Business interruption insurance is designed to cover the losses you suffer if circumstances beyond your control mean your business is unable to trade at full capacity. For example, if a large amount of your stock was affected by a flood or fire, you may be unable to operate normally as a result. Business interruption insurance could cover you for loss of revenue in this situation, covering the losses you experience until you return to business as usual. It’s not uncommon for clothing retailers to employ staff, and if this applies to you then you’ll need to have employers’ liability insurance in place. Whether your employees are temporary, unpaid, contractors or any other type of worker, employers’ liability insurance is required by law. This type of cover can help to defend against a claim made by one of your employees that they've suffered injury or work-related illness as a result of their employment with you. For example, one of your members of staff could injure themselves moving heavy boxes of stock between store room and shop floor. If you’ve failed to provide proper instruction for heavy lifting, then the injury may be seen to be your fault. You may also want to consider purchasing employee dishonesty insurance, which can help to protect against financial losses you may experience due to the fraudulent activities of your employees, such as stealing. If you have employees, contractors, casual workers or temporary staff – either paid or unpaid – working at your shop, you are legally required to purchase employers’ liability insurance. This can help cover claims made by your employees that they have suffered injury or work-related illness as a result of their employment with you. You can also purchase employee dishonesty insurance, which can help protect against any financial loss you experience due to the fraudulent activities of your employees, such as stealing. Buildings insurance can provide protection in the event of unexpected damage caused to your clothes shop or boutique, such as fire, flood or malicious damage. If you have taken out a mortgage on your business premises, your mortgage provider may require you to purchase buildings insurance. If you rent your business premises, the responsibility of purchasing buildings insurance likely lies with your landlord, so it’s a good idea to contact them to confirm this. While buildings insurance can provide cover if your clothing shop windows are damaged, it might be worthwhile purchasing glass cover, or shop front insurance, which can provide financial assistance if you need to replace signs and window decals, or repair damage to the shop’s awning. Contents insurance can provide cover for both the contents of your business premises – such as counters, shelving, display units, machinery or electronic equipment – and your commercial stock. This includes damage caused by hazards such as smoke, water and fire. Check your contents insurance policy carefully to make sure insurance for stock is specifically mentioned, or available as an additional cover, to help protect your stock in case of damage, theft or destruction. Keep in mind that stock insurance only includes the cost price and not the resale value of your clothes. Many insurers include seasonal increases of stock in their policy, which is designed to help you cover the cost of increases in stock during your busiest times (such as before Christmas Day or Valentine’s Day). For more information on what is covered by a stock insurance policy, click the link. You may want to include goods in transit insurance if your business involves transporting clothing, materials or equipment outside of your business premises. You might need to do so if, for example, you are exhibiting your clothing in a fashion show or taking your stock directly to customers. While goods in transit insurance can provide protection against loss, theft and damage of items in transit, it is not required if you use a separate courier to handle your deliveries – in that case, they should provide their own insurance. It’s not uncommon for clothing shop owners to open multiple stores in different locations, and if you run more than one shop then you may be able to take out insurance to cover those multiple businesses under one policy. These combined policies can be incredibly useful to business owners, as it can make renewing insurance quicker and easier to manage. However, it’s worth bearing in mind that a multi-shop policy may mean paying more than you would if you were to purchase individual policies for each shop. For instance, the physical location of your shop’s premises is often an influential factor when it comes to the price of your premium. This means that if one of your premises is in an area with a high-crime rate or a large number of pedestrians, it will likely drive up the price of your collective buildings insurance – even for the shops in relatively low-risk locations. Purchasing comprehensive money cover can help against the loss of business money due to theft or robbery. Money insurance can cover money inside and outside safes and cash registers – and money in transit to and from banks When taking out insurance, it’s important to remember that your clothes shop is likely to have different needs to another, similar shop – and consequently may require different insurance policies for comprehensive cover, this is why you should properly compare all of the clothing shop insurance quotes you're offered. The exact make-up of your business insurance policy will depend on your attitude to the risks that your business is exposed to, as these will determine the types of cover that you need. As an example, a shop selling high-end designer wear is likely to have cover that differs to that of a store selling a more affordable range of clothing – not only because its stock is likely to be more valuable, but also because it may be more vulnerable to theft as a result. In a similar way, businesses situated in a shopping centre in the heart of a large city will likely require a different combination of cover than those based in a small, rural town. If you have specific needs due to the nature of your shop – for instance specialised stock such as bridal wear or a designer boutique – make sure you bear them in mind when choosing your clothing shop insurance package. It’s important that you give your insurance provider an accurate description of every element of your business, so that you can, in turn, get insurance that is tailored to you specifically. It’s also important to make sure that you read and understand the wording of each part of your clothing shop insurance. This is to ensure that you are aware of the full extent of your protection, and which circumstances you are and aren’t protected in.